Ever since the Titan Prometheus sided with Zeus and gifted mankind with fire stolen from Mount Olympus, it has remained a necessary element of survival. Being absolutely essential to survival, it is used to provide protection, warmth, and the ability to cook food and boil water. It is great as a signaling mechanism when lost, it can be used to preserve food, and forge metal for tools and weapons. It’s pretty much a survival skill must. The bonus is that it also offers comfort, brings people together, and is the perfect setting for S’mores and ghost stories. Being able to build one separates man from beast while being able to build the perfect campfire firmly establishes your place as a hero to those you share it with. There are some things you will need, some things you will need to do and some things you will need to know not to do, and some things to make sure your fire is safe and responsible. Let’s start with what you will need. Look at the world of fire as the Holy Trinity of survival, there is oxygen, fuel, and heat and you must have all of them. Oxygen is everywhere that there is ventilation, so make sure that you have airflow. The more oxygen you allow the fire to have the hotter it will burn, but that also means it will use more fuel. Heat is what you will use to get your fire started, it might come from a flint and steel, a match, a lighter, battery and steel wool, a magnifying glass, or some other ancient technique like the bow and drill. You will also need a prepared site for your fire. It should always be away from trees, outside of enclosed areas, as dry as possible, and properly ventilated. To prepare your site, you will need a platform and a brace. A platform should be dry material that provides protection for your fuel from the ground. It can be made of non-porous rock or tree bark and should be approximately three feet square. A brace is meant to ensure that the fire gets the vital oxygen it needs. It can be a long fist thick branch or a dry non-porous rock. Next step is building the fire. Always gather enough supplies for three fires at once to ensure that you can control the pace while being able to keep your fire going while you gather more fuel, ensuring that your fire remains lit for as long as you need it. Start with preparing the platform on the site. Get rid of all material including grasses, rocks, sticks and branches, until you have bare earth. Build your platform by using two layers of the materials mentioned previously. Secure your brace on the platform. Lean your kindling against the brace and on top of the tinder. Break your fuel down from big to small. Using your chosen heat source, light your tinder and then add kindling a handful at a time over the tinder. Repeat this process except add the next handful of kindling perpendicularly to the flames. Once the flames are going well, add more kindling and then fuel from smallest to biggest in a crisscross manner. Set apart any material that isn’t being used in a dry place. Never use waterlogged rocks as they can explode. Never put batteries, ammunition, or compressed objects in the fire. Keep children and everyone else at a safe distance. And since you now know what not to do, here are a few tips on being responsible. 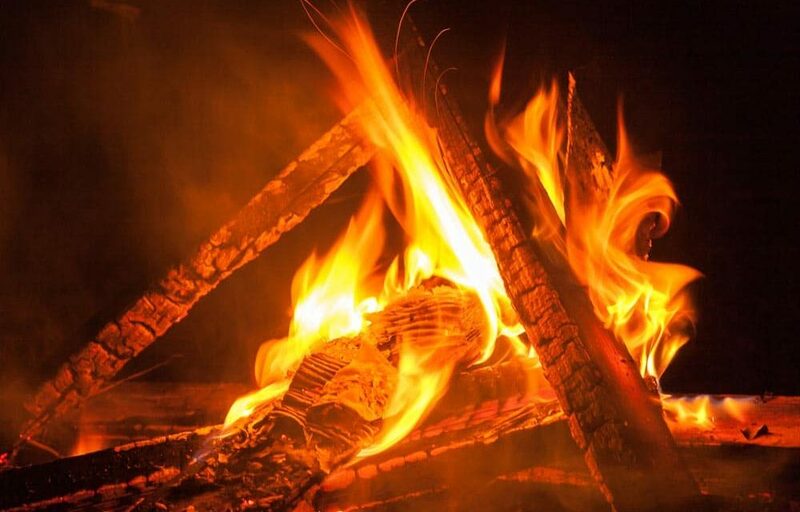 Campfires can easily turn into wildfires so only leave them unattended if you have no other choice. When you no longer need the fire, or you are moving on, make sure the fire is out completely. This means no smoke and cool to the touch. Treat fire respectfully, like it was a gift from the gods. Well, you’ve done it again! You’ve learned one more skill here at Campers and Gear to elevate your status in the wilderness. You should be proud, for now, you can keep warm, preserve meat, ward off predators, signal search planes, or just roast some weenies with your kids. We give you the skills; it’s up to you what you use them for.